I wanted to know what they were experiencing, and why to us they feel so compelling, and so-close. This time I allowed myself to ask them the question that for a scientist was forbidden fruit: Who are you? 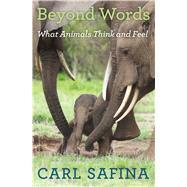 Carl Safina is author of six books, including Song for the Blue Ocean, which was a New York Times Notable Book of the Year, Eye of the Albatross, Voyage of the Turtle, and The View From Lazy Point. Safina is founding president of Blue Ocean Institute at Stony Brook University, where he also co-chairs the University's Center for Communicating Science. His work has also been featured in The New York Times, and National Geographic and a new Foreword to Rachel Carson's The Sea Around Us.